Blush like Betty with the all-new shade Cream Soda, a light neutral coral for cheeks and face with a satin finish. Part of the MAC Archie's Girls Makeup Collection out for Spring 2013, this blush comes in a special compact featuring Archie's favourite Blonde-Next-Door. Limited edition. Part of Betty's side of the MAC Archie's Girls Collection, Cream Soda is a light neutral coral powder blush that comes in the limited edition Archie's-inspired packaging - all white and with Betty on the cover. While this might look like a "why bother dabbing anything on" sort of color, at least for my skin tone, actually though it shows up as a soft, subtle hint of peach that I quite like. It also gives a bit of a sheen (not shimmer) and warmth to my skin. This would probably be a better blush for lighter skin tones than mine, but I find this just perfect for sunny days when all I want is a hint of color (nothing too harsh or pink). Despite being such a light color, there is no chalkiness to this blush which makes it wearable even on my darker skin. 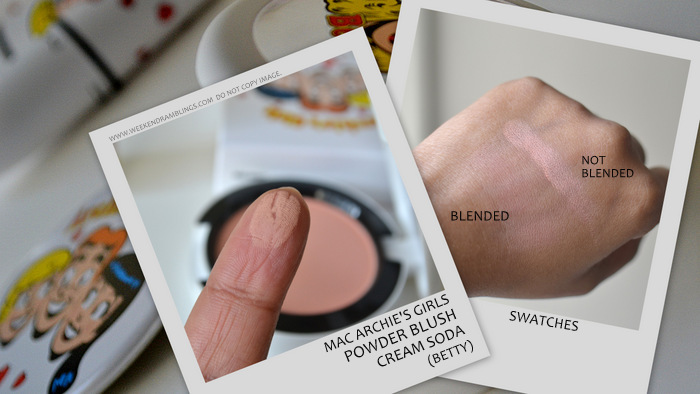 Overall, I think the MAC Powder Blush Cream Soda would be a fabulous pick for lighter skin tones and/or for those who are more comfortable with neutral colors. The softer color makes it easy to blend, and the blush stays on pretty much the whole day - definitely a perfect spring blush! That's a really nice shade!